FASTER CHARGING & SYNC: High-quality Copper Wire and Nylon Braided reduced charging cable resistance enable cable to provide the fastest possible charge via any USB charger. Sync and charge at the same time at the fastest speeds on your windows PC or Mac. INCREDIBLY DURABLE DESIGN: Aluminum shell and Tangle-free nylon braided jacket build the cable more sturdy, It is flexible pull-resistant, softer, lighter, more durable than original device cables. Compatible Phone charger: Compatible with PhoneXs/Xs/Max/XR/X/8/8Plus/7/7Plus/6Plus/6s Plus/6s/6/5s/5c/5,Pad Air/Air 2,Pad mini/mini 2/mini3, Pad (4th generation). PERFECT COMBINATION: 3 pack 6FT are great replacement for the standard cables and very useful for different occasions. Make your life more convenient. WARRANTY POLICY: Free lifelong technical support, 12 months of worry-free warranty, worry-free service! If you have any questions, please contact us. We will provide you with a satisfactory solution! 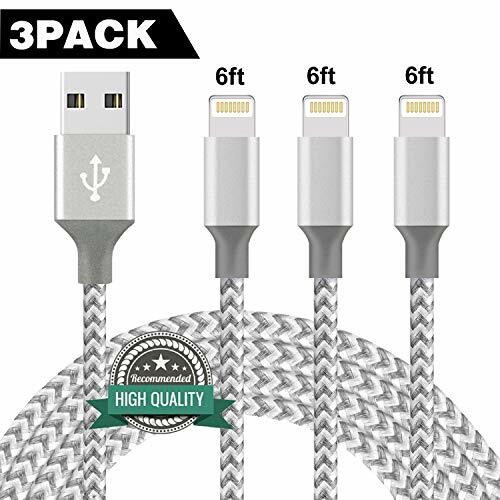 3-Pack 6FT, It's long enough to enjoy the happiness your phone brings to you without worries about sudden power off or short length. Easy to carry since it is lightweight, it suits every occasions, home, office, car, travel and more places.